Martin is looking forward to going on holiday to the Caribbean for the first time ever – to celebrate his 50th birthday. “At my age, I think it’s generally a good idea to forget about birthdays but going to Jamaica has always been an ambition of mine and it will be good to mark the start of the next stage in my life,” he says. Until 5 years ago, Martin had a busy working life as the manager of a company that made fireworks. “With the interest in having fireworks at Christmas, New Year and birthday parties and summer events, as well as on November 5th, we were doing really well and had got the contract to do the New Year display on the Thames that year. I was at a test site when there was an accident – it should never have happened but there was an explosion near to where we were standing. Fortunately in one way we were protected from the debris of the blast but I had taken my ear plugs out to take a phone call, so the noise of the blast did some real damage” explains Martin. After three weeks, a series of hearing tests confirmed that Martin had suffered noise damage to both ears, but some of the temporary deafness that he experienced in the couple of days after the blast had worn off. “Everything sounded far away and muffled and I had some annoying tinnitus – that made it hard to hear what people were saying to me,” he says. After being off work for 4 months, the company agreed to pay Martin compensation for the damage to his hearing but, unfortunately, he had to step down from his job. “And to make things worse, although the money was promised, it was going to take time to come through, so at the age of 45 I felt as though I was on the scrap heap,” sighs Martin. The next few months were a trying time for the whole family as Martin struggled to come to terms with his disability and the complete change in his circumstances. “I have never been one to have hobbies – my work was everything and I was just lost without any direction,” he says. Six months after the accident, Martin began to feel more positive and decided that he would try to get the best hearing aid possible and then see what other work he could do. “I just wasn’t ready to retire – I knew that I had a lot still to offer and I thought that by getting the most out of the hearing I still had, I would find something,” he says. For the next few months, Martin went from his GP to an audiologist to various consultants and investigated the different options for hearing aids on the NHS. “Everything took so much time and had so much red tape – having hearing loss isn’t life threatening, I realise that, but why does it take so long to get the right treatment?” questions Martin. Martin then faced a long wait both for the process of getting a heading aid and for his compensation money to come through. “I tried bar work, but that was no good, I knew that after two nights. I got so many orders wrong... Then I did a bit of gardening and odd jobs but it was miserable in the wet weather, so I couldn’t see myself doing that. My big break came when someone offered me a franchise in a delivery company – I tried it for a week before committing myself and I really did enjoy it. It didn’t involve much interacting with people – although it was nice to have a quick chat, I got out during the day and drove around, but it would have been better if my hearing aid had come through,” he says. After 12 months of waiting, no hearing aid but the compensation was paid. 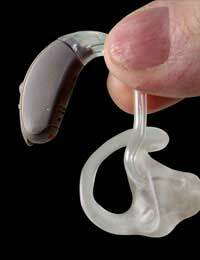 “With my wife’s support, the first thing I did was to go private and get the best digital hearing aid I could. It cost £4000 but I got it within the month and it’s fantastic. Such a shame the NHS can’t get its act together,” he says.